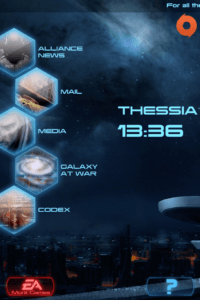 The meta-game system is called “Galaxy at War” and includes the multiplayer co-operative mode in Mass Effect 3 (included with the game), the Mass Effect Infiltrator iOS game (paid app), and the Mass Effect 3 Datapad iOS app (free). Each allows a player to add to his/her “galactic readiness” in the single player game. By increasing the readiness level, the player can achieve a more favorable outcome in the game. 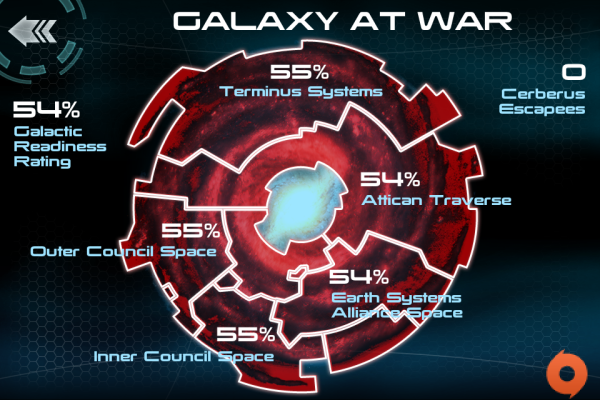 I won’t say much about Mass Effect 3’s multiplayer mode because I want to focus on the mobile aspect of Galaxy at War. You can read all about multiplayer on masseffect.com, or check out the video below. Essentially the more you play the multiplayer mode, the more your Galactic Readiness goes up. It’s a fun diversion from the main game, but most Mass Effect fans are here for the single-player story, not multiplayer. I’m not a big mobile gamer, but I appreciate having a diversion on my phone when I’ve exhausted my social media streams and various news feeds. I was drawn to Mass Effect Infiltrator because it ties in with Mass Effect 3, and numerous reviews were praising it for excellent graphics and solid gameplay. 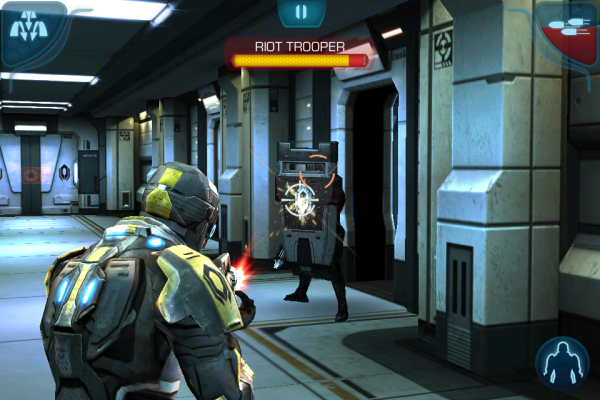 This is a screenshot of actual gameplay from Mass Effect Infiltrator. It's amazing how far graphics have come on mobile phones! During the game, you can collect “intel” dropped by various enemies when you kill them. The game then gives you the option to either trade it in for credits or upload it to Galaxy at War. Credits allow you to purchase upgrades to weapons, armor, etc. for your character in Mass Effect Infiltrator, while uploading to Galaxy at War raises your galactic readiness level in Mass Effect 3. 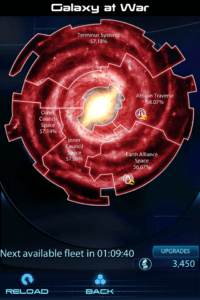 You can view galactic readiness on the Galaxy at War map in Mass Effect Infiltrator. 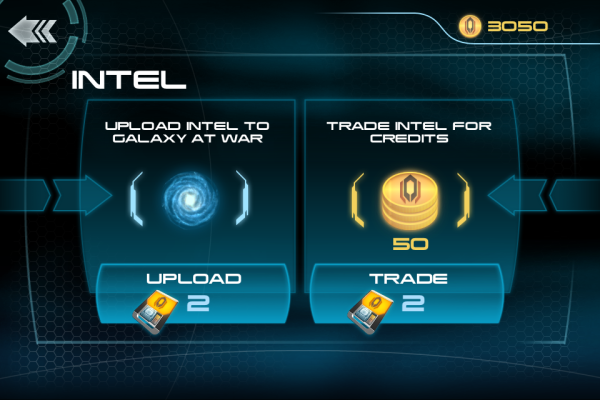 You can choose to upload intel to Galaxy at War or trade it for credits to purchase upgrades for Mass Effect Infiltrator. I was away from home most of last weekend, so I ended up playing through a good portion of Mass Effect Infiltrator in my spare time. I chose to upload all of the intel I found to contribute to my galactic readiness level. This was really fun, because although I couldn’t play Mass Effect 3 (and was unable to play it over the weekend), I could still add to that core game experience by uploading intel. Not to mention the fact that Mass Effect Infiltrator is the best-looking iOS game I’ve played and the controls are actually quite good for an action game on a small touch-screen device. This is the kind of app I’ve been looking forward to since I got my first smartphone. A lot of games are filled with detailed history and lore to create a backstory for the universe in which the game takes place. 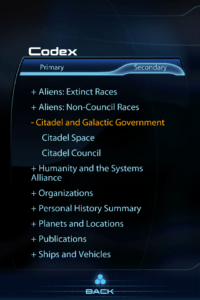 Mass Effect 3 Datapad makes the Codex entries from the game (which describe various aliens, technology, and galactic history from the Mass Effect universe) available anytime, anywhere. This is great information to access on your phone because you can brush up on it while waiting for the next level to load in the game or any time you’re away from the game and feel like reading it. 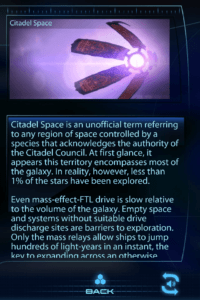 All Codex entries from the Mass Effect games are available in the Mass Effect 3 Datapad app. Each entry in the Codex provides some background information on aliens, technology, locations, and events in the Mass Effect universe. Another nice feature of Mass Effect 3 Datapad is how it integrates with the game’s events and characters. 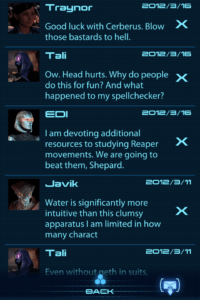 As you complete various missions in the game, you receive messages from characters in the game from within the Mass Effect 3 Datapad app. For example, after one mission, a character named Tali has a few drinks to help deal with the stress of the situation. Within the game you can have a humorous conversation with her while she is drinking, but you’ll also get a “drunk text” (complete with poor spelling) inviting you to have a drink with her via the Datapad app. Later she’ll send another text complaining about a hangover. It’s a small addition, but I found it entertaining. Characters from the game send you messages as you complete various missions or reach important plot points. The Mass Effect 3 Datapad app also includes a mini-game that lets you add to your Galactic Readiness level. The galaxy map has several locations that you can deploy a fleet to. Deployments take a certain amount of time (displayed as a countdown). For locations that offer a higher readiness level, the deployment takes longer. Each deployment also provides credits that you can use to upgrade your fleet (buying additional fleets, decreasing deployment time, etc.). It’s a simple game that offers a fun distraction; I found myself keeping track of my deployment times so I could re-deploy fleets to new locations as often as possible. A Galaxy at War map allows you to deploy fleets to various missions to add to the galactic readiness level. 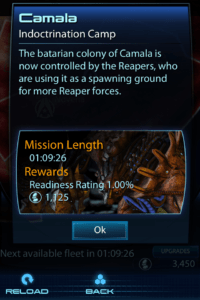 Each deployment offers a balance between mission length and rewards. The last thing I should mention is the News and Media options. The News feature simply displays a feed of tweets with links to share the status update on Twitter or Facebook. The Media feature includes several videos and screenshots from the game. All of these are also available on the Mass Effect website. You can also view a feed of news from the Mass Effect Twitter feed or view screenshots and videos of the game. Both of these apps require accessing EA’s Origin gaming platform. Origin is a digital storefront that allows players to purchase games, set up a profile, and connect with friends via instant messaging. The mobile version within the apps has limited functionality; you can edit your profile, view friends’ online statuses and profiles, and check news and friend invites. 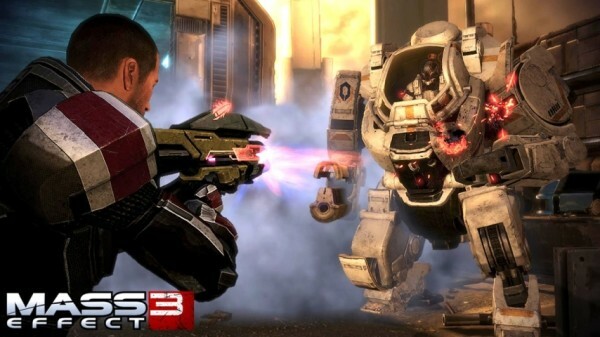 Mass Effect 3 was one of the most-anticipated games of 2012, so I’m not surprised that Electronic Arts and Bioware went to such lengths to offer a broader experience using mobile apps. I just hope that this sets a new precedent for future triple-A games to do the same. If you’ve used any of these apps or have additional thoughts on mobile integration with PC or console games, leave a comment!